Waste is energy and energy is money! Solve the environmental problem of waste biomass. Put primary biomass in value. Increase incomes adding other waste biomass to cattle waste (manure, etc.). Reuse of anaerobic digestion liquid fraction for irrigation or nutrient removal according to disposal requirements. Nutrients recovery (N and P) for mineral/organic fertilizers production, together with the solid fraction of digestate. Thermophilic range (55,0 ºC). Half digestor size related to the mesophilic range. 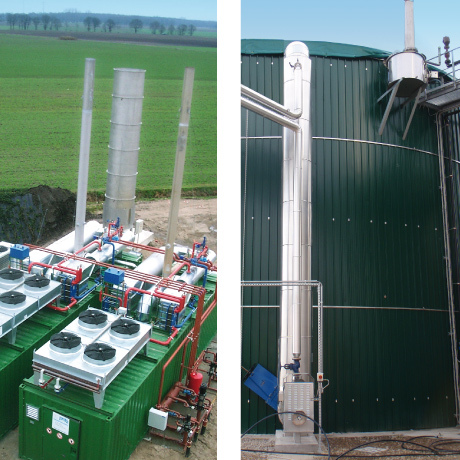 Anaerobic co-digestion, solid-liquid separation of digestate, biogas desulphurization (Bidox® system) and different Nitrogen removal/recovery technologies (MBR- NAS® process) from anaerobic digestion liquid fraction effluent. Anaerobic thermophilic digestion of urban wastewater dewatered sludge. More biogas production and less sludge disposal cost related to the mesophilic range.